Num Pad. A cheap and useful gadget for my notebook. 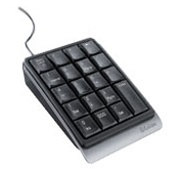 I found here an interesting gadget for facilitating number input, in your laptop application. My Dell 430 12′ notebook has the common function keyboard but numerical input is insufficient and hard to familiarize with all there shortcut and stuff. For 13 €, my problem is now solved.